You might have noticed how the world of genetics was shaking as the giants of theoretical population genetics started discussing some of the most fundamental questions in the arena of Twittersphere. This happened after the publication of Andrew Kern and Matthew Hahn’s paper titled “The Neutral Theory in Light of Natural Selection“. For the sake of all the early career scientists who might be under the false impression that they don’t understand anything, while all the fancy last authors have it figured out, I have decided that at least some of the Twitter gems shall be recorded. I’m not going to walk into the lion’s den and try to argue for or against neutral theory or even comment on the new paper. I’m merely providing a record of what’s been said by others, and by the end of this post you might be more confused about neutral theory than ever (#sorrynotsorry). And Twitter responded in all sorts of ways. Kern and Hahn’s paper polarised the popgen Twittersphere. My opinion: number of studies mistaken by sticking too closely to the neutral theory MUCH LOWER THAN number of studies carelessly jumping to false adaptive stories. If we count in terms of adaptive loci in a genome for which we do not have sufficient statistical power rather than in number of isolated case studies then we have many more false negatives than false positives. For example the MK test shows much more adaptation than PAML finds. 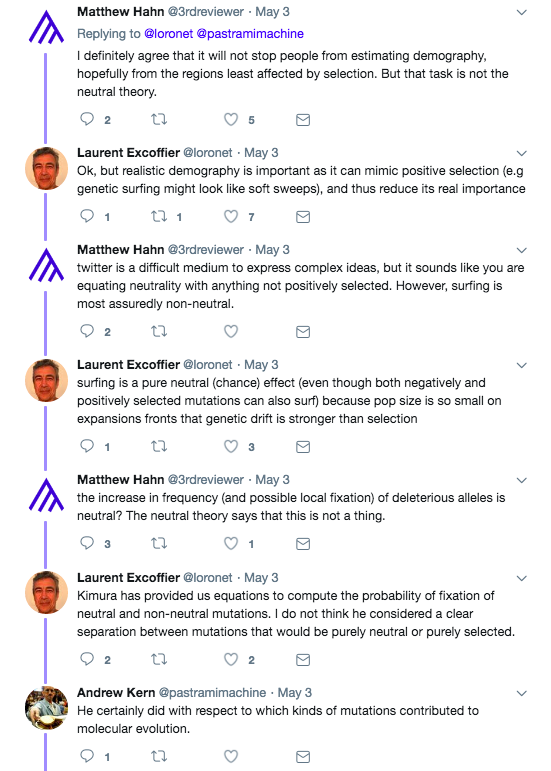 The whole debate goes as deep as to the question of how much genomic variation is shaped by natural selection and what are the relative roles of positive and negative selection in shaping the patterns of variation. In the new paper, Kern and Hahn (2018) lay out the original lines of evidence for the neutral theory and step by step explain why they are not only wrong, but why they were never correct in the first place. For instance, based on Haldane’s estimate of ‘the cost of natural selection‘ (Haldane 1957), Kimura argued that the rate of evolution is too high to be explained by selection and many mutations must be neutral (Kimura 1968). However, Kimura’s estimate was immediately challenged, e.g. by Maynard Smith (1968), who suggested that the rate of evolution reported by Kimura might be overestimated by several degrees of magnitude. From large datasets and genomic data it is now clearer that selection has far-reaching consequences for genomic variation at linked neutral sites through hitch-hiking (Maynard Smith and Haigh 1974) and background selection (Charlesworth et al. 1993). 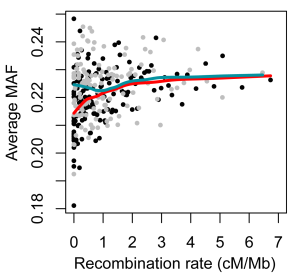 Some of the most striking imprints of selection can be seen in the correlation between recombination rates and levels of polymorphism (Begun and Aquadro 1992) and between recombination rates and allele frequencies (Stajich and Hahn 2005; Lohmueller et al. 2011). But the major subject in the debate that emerged after the publication of Kern and Hahn’s paper is whether we should abandon the neutral model completely or not. Analyses of genetic variation assuming that all SNPs are selectively neutral can be misleading if many of these are actually linked to sites under selection and the frequency spectrum used for demographic analyses is skewed by SNPs originating from regions near genes and with low recombination rate (Lohmueller et al. 2011). Regarding the abuse of terminology concerning the neutral theory, there’s a very enlightening post by Casey Bergman where he explains what he titled the “Neutral Sequence Fallacy”, i.e. “the incorrect notion that if a sequence is neutrally evolving, it implies a lack of functional constraint operating on that sequence, and vice versa. less power, I think. It actually predicts very little about patterns in nature. Not sure I understand your questions, but I am certainly not denying existence of nrly ntrl muts. Existence or not is not relevant to explanatory power of theory. I am trying to make a scientific point about last week’s discussion: one cannot save the neutral theory by saying the linked selection is *just* a change in Ne. And in case the take-home message is not immediately obvious: linked selection is not just a re-scaling of Ne. Even in a species like humans, there is nothing “neutral” about the effects of linked selection. Yea, I agree. It’s quite fortunate the mathematics works out such that Νe param absorbs a lot of this, as we can see signal clearly. The downside is that it’s muddled how many think about Ne, I think. If you are interested, at this point there’s a 50-tweet discussion about effective population size, but I’m not going to put it here because that would be a little too much. Instead, I’ll just put one more interesting discussion. We were either totally right or mostly wrong. Or somewhere in between. Charlesworth B, Morgan MT, Charlesworth D (1993) The effect of deleterious mutations on neutral molecular variation. Genetics, 134: 1289–1303. This entry was posted in evolution, mutation, population genetics, selection, theory and tagged neutral theory, selection. Bookmark the permalink.